The Mohican Trails Club is a non-profit unincorporated association which was organized in 2004 to assist governmental agencies with trail maintenance responsibilities and to raise funds to assist in those efforts. tomorrow and for centuries to come. appreciate the same beauty we behold today. Spirit of Cooperation: We cherish our partnerships with agencies, communities, clubs, volunteers, students, and citizens. We collaborate to achieve a common goal. Sustainability: We seek to minimize our impact on the environment and incorporate the ideals of sustainability in our everyday operations. Our inititial focus was to ensure all existing hiking trails in Mohican State Park and Forest were accessible and passable. The first grant that was written and successfully obtained purchased trail working tools, such as chainsaws, chainsaw safety equipment (cut resistant chaps, helmet with face shield and ear protection), heavy duty fire fighting rakes/hoes (called McClouds), special ax/pick tools(called Pulaskis), shovels, pruning saws and typical garden tools. Members were provided safety courses by Park and Forest personnel prior to beginning trail clearing activites. Trail clearing continues to be one of our primary functions. The club has also proposed numerous capital improvement projects for consideration by the Park and Forest agencies. The projects fell into two classes; maintenance/replacement of existing bridges and walkways and new construction projects. Maintenance projects included the replacement of pedestrian bridges and wooden walkways that had fallen into disrepair. New construction involved the re-establishment of trails that had been closed or abandonded due to loss of pedestrian access and required new bridges or walkways. Our most ambitious project involved the construction of a series of stairs and platforms at Big Lyons Falls. The Big Lyons Falls site includes the cliffed gorge accessed by the Lyons Falls hiking trail and the Big Lyons Falls grotto. In the 1930's, as part of Franklin Roosevelt's New Deal vision to bring work to those impacted by the Great Depression, CCC (Civilian Conservation Corp) workers were brought to the Mohican area to rebuild the forest and construct projects to provide access to the Park and Forest for recreational purposes. As part of that program, steps were carved in the standstone cliffs to provide access into and out of the Big Lyons Falls grotto. However, heavy wear and erosion from 80 years of foot traffic made the steps difficult to navigate by visitors, and the worn out stairs were eventually closed by the Park. 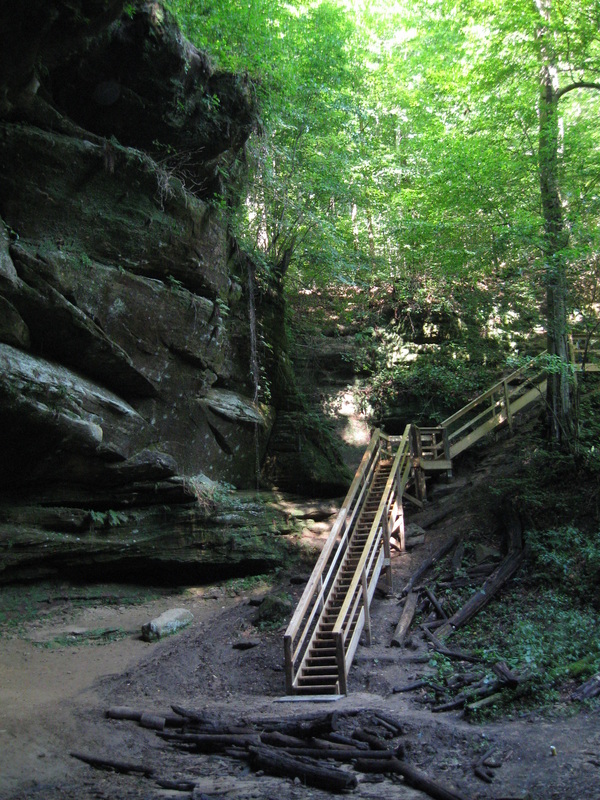 In 2011, the Mohican Trails Club obtained a grant and donations to purchase materials to construct stairs to re-open access to the falls. ODNR engineers surveyed the site to determine the best routing for the stairs and provided detailed plans for construction. Materials were purchased by the club and transported to the site with the assistance of Park personnel. The construction took a year to complete and the stairs were opened In October of 2012. Our Photo Gallery includes a slideshow which chronicles the stairs construction project. Typical boardwalk project--Lyons Falls Trail. Stairs under construction. Picture from base of Big Lyons Falls. The link below will take you to our Yahoo Users Group site. This site contains archived pictures, past work projects, articles of organization and other documents. To access this site, you will need a Yahoo account. Once you click the link and arrive at the MTC users group site, just click on "Join Users Group" and sign in as you would to your normal Yahoo account.